“Tinga” denotes torn or shredded meat in Spanish, but to Western ears Teeengaaaa rolls off the tongue like an exotic dish you can pay good money for, but make at home?! Never! 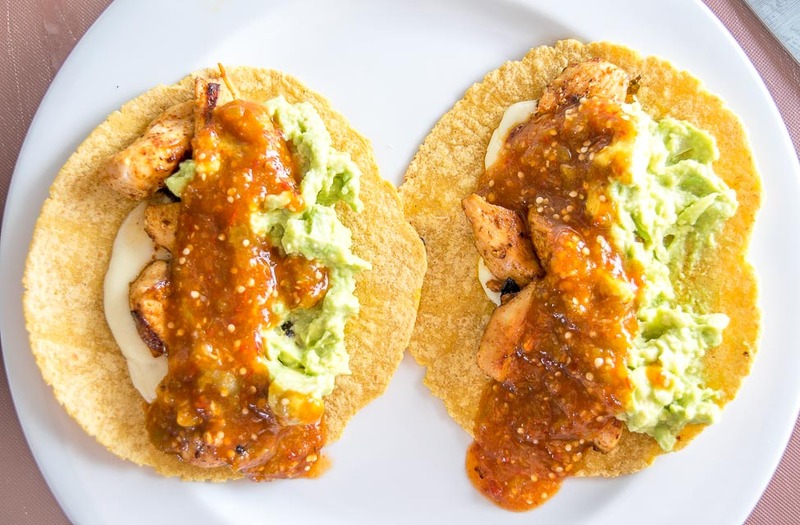 Taquerias north of the border have responded by making Tinga Tacos the star attraction, but the long trip up from Mexico has left these popular tacos struggling to reclaim their identity, and not tasting nearly as Tingalicious as they could be. Luckily it’s easy to make your own batch of Teeengaaaa, and doing so will once and for all confirm that they can taste just as good as they sound. 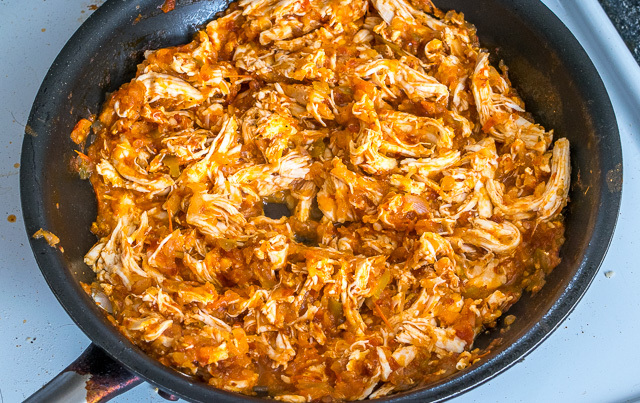 If you’ve ever come across a Tinga recipe there’s a good chance it relied on tomatoes as the base. While this will produce a sauce that ain’t so bad the first few times you have it, I think it whiffs on the true potential of the dish. Pairing the tomato with a few of these beauties…. …gives the sauce a sharp tartness that goes missing if you are only using tomatoes as the base. Now add the smoky heat of chipotles…. …..and you’ve got a rich, complex sauce that will outperform anything you can get from your local taqueria. This batch was 4 tomatillos, 2 roma tomatoes, 1/2 onion, 2 garlic cloves, and 3 chipotles in adobo — this gets simmered with a 1/2 cup of stock, 1/8 teaspoon of oregano, a dash of cumin, and then mixed with two shredded chicken breasts. Keep some of the adobo sauce on standby as the initial heat of the sauce can sometimes get diluted once you add the chicken. I added approximately 2 tablespoons of adobo sauce and a few more pinches of salt to the above pan. 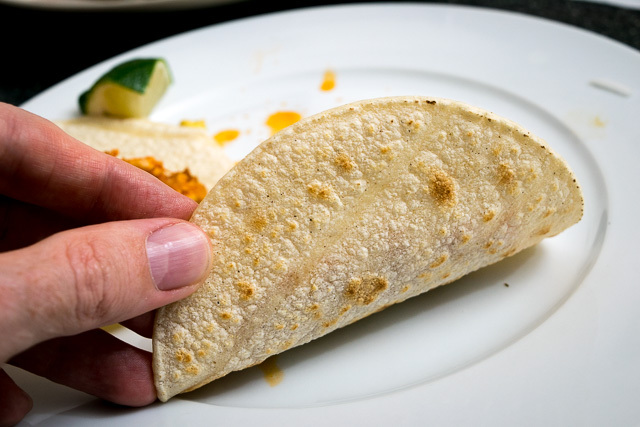 Serving with a stack of warm corn tortillas is totally acceptable, but it’s worth trying them with the tortillas crisped up if you have the luxury of eating them as you make them. Using a comal or skillet, cook for 2-3 minutes on medium-high heat or until brown spots start to appear on the underside. This slightly crispy version lies somewhere between a taco and a tostada and it is delicioso. Normally I’m a big fan of customizing the toppings to your liking, but there is one specific combo that is worth trying at least once in your life, and there’s a chance it will be the end boss of Tinga toppings for you. 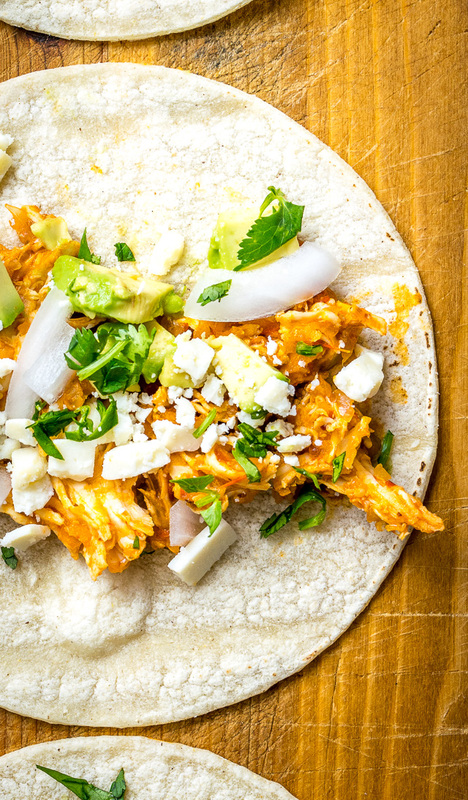 Avocado bits, finely chopped raw onion, and crumbled cheese pair with the crisp, Tinga loaded tortilla as if they are all a pack of old buddies. Cotija and Monterey Jack are good choices for cheese. Pickled onions would work good too. Not pictured is the squeeze of lime juice that officially sends this combo into the Tingalicious category and will keep people coming back to the most authentic taqueria in town (yours). 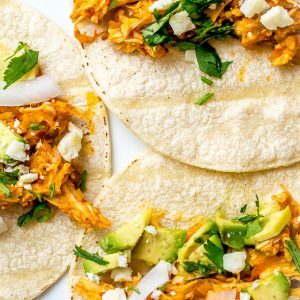 Using tomatillos in these Chicken Tinga Tacos gives them an authentic flavor that is tough to beat. Add 1/2 cup stock, 1/8 teaspoon oregano, a dash of cumin, and a pinch of salt to the sauce. 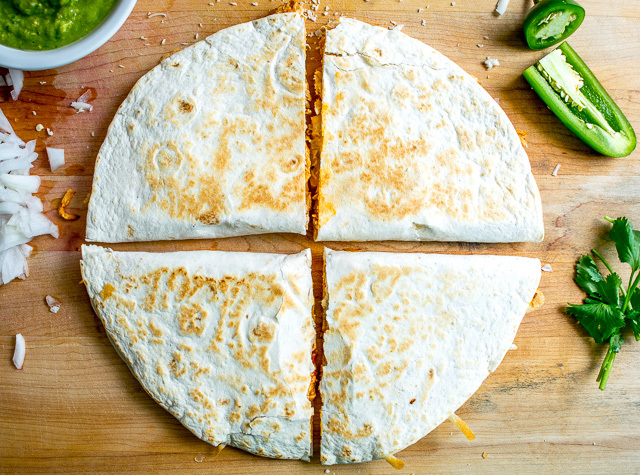 Garnish with finely chopped avocado bits, cheese, diced onion, and a sprinkle of lime juice. 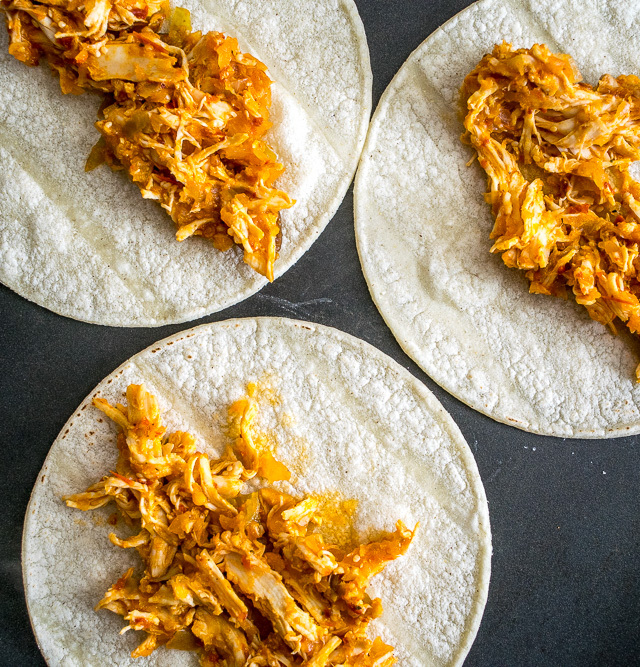 If crisping up the tortillas, add the tinga mixture to a tortilla and cook on a skillet or comal over medium-high heat until brown spots appear on the underside (2-3 minutes). 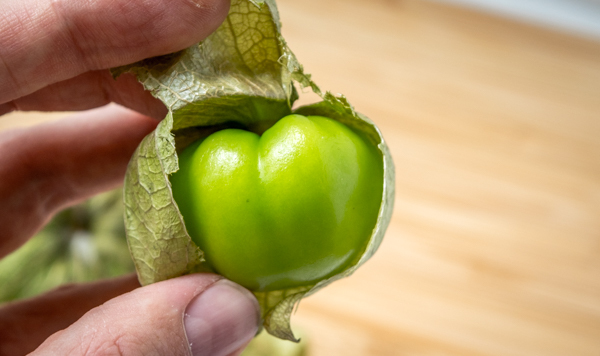 If you don't have fresh tomatillos, you can use canned tomatillos and get a similar result. Don't worry about roasting the tomatillos if you are using canned as it doesn't have the same effect on tomatillos that have been resting in liquid. Still hungry? 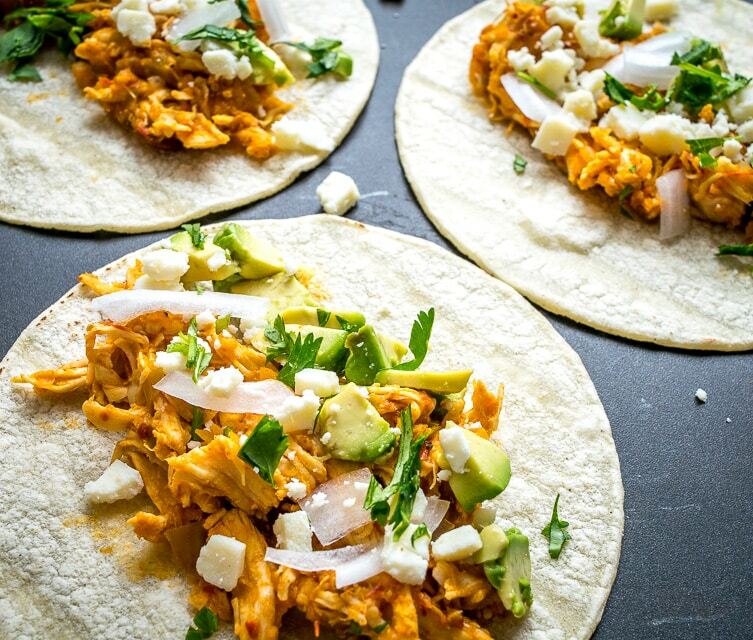 You can make Tingadillas with your leftover Tinga! 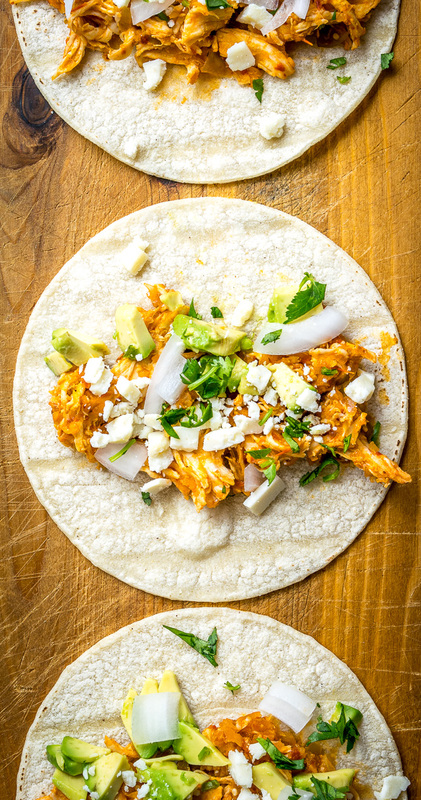 Or here’s another option for some Easy Chicken Tacos. Oh my!! That was muy bueno! I had to use canned tomatillos and Monterey Jack cheese but wow that’s a great taste. I triples the recipe for 6 people and ended up using 2/3’s of the recommended chipotles in adobo which was just the right heat for my wife. Everyone enjoyed it and loved the taste. I also found a new friend in the chipotles in adobo!! Hola Keith! Thanks so much for the feedback, glad you guys enjoyed it. I’ve made it using canned tomatillos as well, getting just as tasty results…maybe I’ll mention that in the post so people know that’s a viable option.